In April 1862, the Confederate Congress, desperate to deal with mounting manpower shortages and the problem of controlling remote, unprotected areas of its 750,000+ square miles of territory, adopted an official military policy to promote and control the use of guerrilla warfare and petite guerre. Their experimental military policy, part of a national strategy to win independence, created an authorized service of partisan rangers, men tasked with intelligence gathering, resource procurement, raiding warfare, and harassing the enemy behind-the-lines of regular armies. Like the Continental Congress during the American Revolution, Confederates were facing the most powerful military force in the world, and their experimentation on the edges of military convention led to many different technologies and schemes. Indeed, the Confederate experience with experimenting in guerrilla warfare is a pivotal moment in American military history. The U.S. government’s reaction to Confederate guerrilla warfare spawned the Union Army’s own General Orders No. 100 in 1863, also known as Francis Lieber’s Code, which recognized sanctioned partisans as legitimate but struggled to define the many types of wartime irregular forces. The code would eventually become one of the seminal documents at the base of the international system of laws of war to the present day. Yet, for all of the writing on the American Civil War, the study of Civil War guerrillas remains in its infancy. Among the most well-known of these sanctioned irregulars was John Singleton Mosby, who organized and led the 43rd Battalion of Virginia Cavalry also known as Mosby’s Partisan Rangers. This hardened combat unit so dominated Fairfax, Fauquier, Loudon, and Prince William counties in northern Virginia from 1863 through 1865 that it became known as “Mosby’s Confederacy.” This ongoing digital humanities project on the partisan rangers and the military policy that sanctioned their activities includes the development of a comprehensive list of sanctioned Confederate Partisan Ranger units, digital mapping related to the recruitment of these units, and the creation of the first comprehensive social, political, and military history of Confederate Partisan Rangers. Through the use of digitized Civil War source materials, including compiled military service records and official records from the war, the study demonstrates the geographic extent of the Confederacy’s use of authorized petite guerre during the conflict. 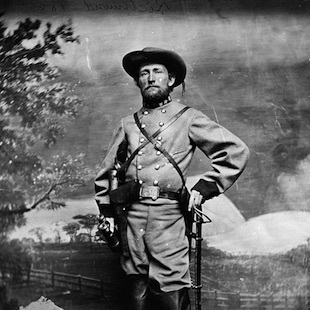 If the Pulitzer-prize winning southern author Robert Penn Warren is correct, and the American Civil War is the seminal event of our history, then the military failure of the Confederacy and the many experiments that came with it remain some of the most important military defeats for Americans to study and understand. In the end, this digital humanities project will illuminate another dark corner of America’s bloodiest conflict.